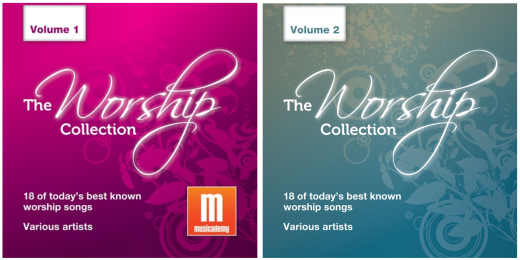 The Worship Collection: 36 worship songs to download in two albums – NOW HALF PRICE! « Who killed the contemporary Christian music industry? We’ve taken 36 of our most popular backing tracks, remastered them and created two downloadable albums called The Worship Collection Volume 1 and Volume 2. Each album retails at $12.99/£12.99. For a limited time only they are HALF PRICE – $6.49/£6.49 each!! (thats 36c/36p a song – so considerably cheaper than buying it on iTunes). Buy the albums using the following links Volume 1 and Volume 2. As with our backing tracks, they include vocals and are intended for your personal listening in this format rather than as backing tracks but feel free to use them in whatever forum you would like. You can listen to 30 second audio previews of each song in the links below.